This is greatThe more you think you know, the less you know(another version of what lights to use and wherehttp://www.ceolas.net/#li8x)I like the photo on the right best… incandescent it turns out, of course…Thank you also for the note about clear lights throwing odd reflections on pages etc:This is very true, I just checked – having just used frosted in reading lamps, I was not aware of it, it's actually very noticeable. Being more or less point source lights it makes sense.Quickly bought some more candle lights… had been a bit relaxed about it, thinking "well can just stick in clear lights instead".And all this nonsense,because the ruling political clowns in Europe can't/won't deal with the emissions themselves,and/or stick a tax on light bulbs to give them the state income the governments all say they need(last year 2 billion – yes, 2 billion – incandescent light bulb sales in the EU, as in the USA). I've stocked up on 40W frosted lamps for reading, and use a frosted 30W IR halogen energy saver for detailed desk jobs. I find that standard E27 bulbs work best at close range. For ceiling lights I use reflector lamps which focus the light down to the floor or table where it's needed. For mood lighting (which is what I mostly prefer at home) I use wall luminaires with incandescent or halogen reflector lamps, connected to a remote so they're easy to turn off with a single click when I leave the room. I love to have many light points at different levels and light intensities in each room, in order to maximise options depending on mood and task. Contrary to what some anti-lightbulb lobbyists seem to believe, having many lamps installed does NOT mean using more electricity, as they only use electricity when turned ON. Rather, it's easier NOT to over-illuminate if there is the option of dimmer (or dimmable) lamps in the room when you don't need as much light. It's of course not number of luminaires that count, but how many is in use, and for how long. Some examples from my home: * I have an Art Deco luminaire I only light if I have guests. * I have a couple of dim peach lamps I only use when I light a fire, to match the firelight. * I have a reflector lamp over the freezer I only light to see what's in it. * I have countertop halogen ramps I only use when cooking or washing up. * I have ceiling triple-spots I only use when cleaning. * I have light tubes I only use around Christmas.I'm sure its similar for most people. Yes sounds familiar..shows the value of varietyCompare the advice (even if supposed savings were true) of"Switch all your lights to CFLs and save lots of money"with something like"Eat only bananas and save lots of money" :-)Also,what you say of more lights = not necessarily more energy waste,try telling that to some pro-ban politicians…The more people that repeat the same thing, the more true it is assumed to be(clever politicians talking about "saving energy output of Romania" "CFLs lasting 10 times as long and with 80% energy saving" etc)Nice simple figures and illustrations are given for journalists and news-repeating bloggers to regurgitate, which they happily and uncritically do. Yes, it never ceases to astonish me how few actually bother to check the facts before mistaking a simple PR slogan for truth after it has been repeated enough times. I've just read this re "white leds"http://gadgetwise.blogs.nytimes.com/2009/09/24/is-this-the-lightbulb-of-the-future/?apage=2#comment-39295"Fluorescents (CFLs) produce light by using the phosphors coating the tube to convert UV from excitied mercury vapour to visible light.There are different phosphors for different part of the spectrum, which determines the color cast. White LEDs use basically the same process — a far-blue or UV LED covered with phosphors. 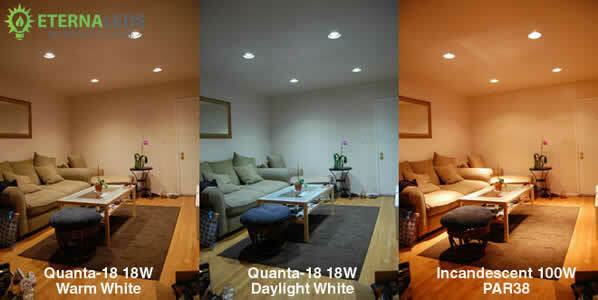 CFLs and white LEDs produce very similar light. Their light spectrum is “bumpy”, due to the contributions of the different phosphors, whereas incandescent light and sunlight have a smooth spectrum. "– white Leds not that great either? That's correct. That's why LED light looks more fluorescent than incandescent: because it is. But where most "warm-white" CFLs tend to look more or less pink-white, the "warm-white" LEDs I've seen tend to look more yellow, or sometimes even green.The GU10 LED spot I tried at home for my Energy Saver Review made the room look just as dull as any CFL would. Only when I switched back to halogen did the warmth return and colours come alive again. I've sent for more LEDs now (one Cree) to see if more expensive ones can look better than that. So the jury is still out… just not impressed by what I've seen so far. I had hoped the RGB type LEDs would give a better white but the two I've tried didn't even produce a white. Please let me know if you find any that do. Thanks, I just saw someone else mention this article and was about to search for it. Should blog about this.